This Sunday we would like to talk about a topic that everybody has been talking about recently: the upcoming August 21 solar eclipse. In case you were wondering, a total solar eclipse is when the disk of the moon completely blocks out all light from the sun. 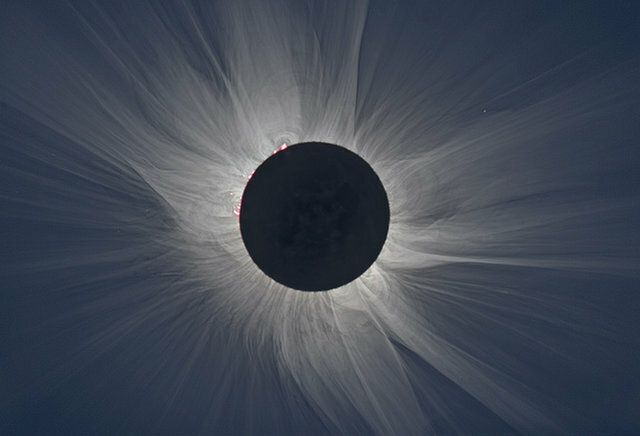 This allows people on Earth to see the sun's outer atmosphere, the corona, which is usually impossible to see due to the sun's blinding light. Of course, this corona is far from just an indistinct haze. People have reported seeing things from great jets of gas to ribbons of light curling out into the sky. So how can you see this eclipse? Essentially, unless you live on a narrow strip of land that spans coast to coast in the United States, you will only see a partial eclipse (at least in North America). Fear not though, as anyone could still see the eclipse as long as they were protective eye-wear. This could range from eclipse glasses from a legitimate vendor that meet the ISO 12312-2 international safety standard to a simple pinhole camera. However, if you are lucky enough to be present along the path of totality, then expect for a fantastic show that could last up to 2 minutes and 40 seconds. Some locations along the line include Salem, OR; Casper, WY, Nashville, TN; Charleston, SC etc. Keep in mind though that even if you will be seeing the total eclipse, protective eyewear must be worn at all times other than during the few minutes of totality.